Would love to see what natives people are keeping. There are so many great aussie fish out there. If you are keeping aussie fish put some photos up for us to have a look at. 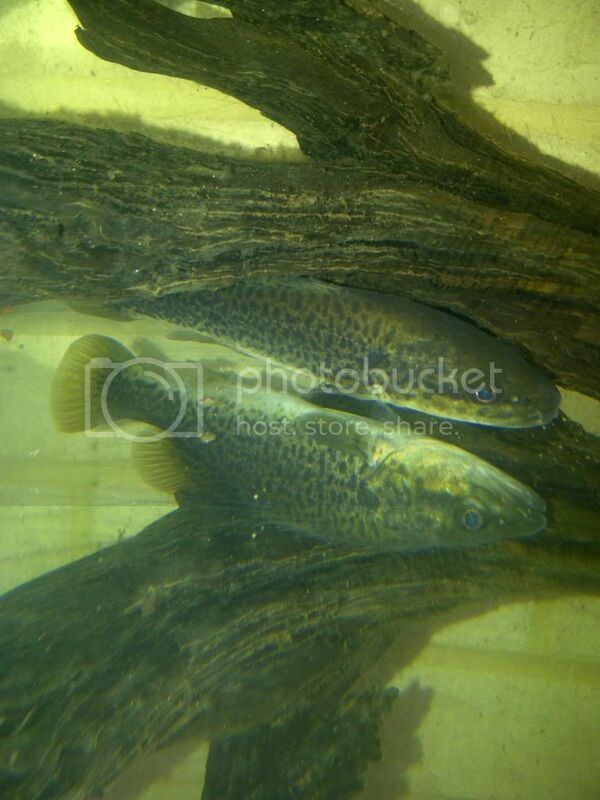 Ill try and get some pics of my cod and baby barra over the next couple days. Edited by malawiman85, 30 August 2014 - 05:30 PM. Cant wait to see your tank FrontyKwal. I eventually want to do 2 huge native TB displays a Murray Darling Basin themed Tank (Tandanus, Perch, Cod, short finned eel maybe, yabbies while they last) and a Northern Aus Mangrove themed setup (Barra, scats, archers maybe freshwater crab or crays if I can get them). The MDB one is pretty much done in my pond tank. Down the track i need to replace my marron with some big yabbies and try and find an eel. Ive got a mangrove jack display in my living room and am planning on doing a 4x2x2.5 southwest australia display with some marron and pygmy perch and a nightfish or two if i can find some. Ice, i have read about your serial killer mangrove jack... they are a cool fish and i would like to put one in a tank by itself. I had been wondering if anyone had done a wa native tank. Not a lot to choose from but would still be an intersting display. It would indeed, mine used to be a native display with archers, scats, barra, tandanus, mono argent/sebae and the jack and I've ended up with just the Jack. Luckily he was my favorite! I've also had a few cod but not much luck with them either, Jack ended up eating them both. One as a trial tank mate and one because it committed suicide by trying to eat a tandanus and getting spined. The issue with native displays with larger natives is they tend to get aggressive at some point and just obliterate their tank mates. Only fish I have seen with any kind of regularity is barramundi, but even then forget having anything they can fit in their huge trash can mouth so it still narrows it down a bit. Natives are great fish as a whole, and often over looked by Australian fish keepers. I have a Mangrove Jack at 45cm, that has to also be kept solo. He lasted with tankmates until he hit around 25cm. Now he attacks everything, including me. Archers are one of my all time favourite fish; they look cool, can shoot water, are hardy (easy to care for), cheap and are model aquarium citizens. Can't really ask for much more out of a fish! My Jack is in a 5x2x2 which is getting a bit small, he will be moved to my 8x3 when we move house early in the new year. I'm considering maintaining his new home as a marine environment. As most large mangrove jacks are found on off shore reefs. Added salt may enhance his growth rate and get all I can out of him. MJ's are one of the most amazing fish I have ever kept (and I have kept just about everything). The only downside could be said that most will eventually need their own tank, but to me that is half the attraction. Dovii, Jag's and other Cichlasoma seem like skirts after keeping an angry Jack! Would be very interesting to see how it transitions into marine Alex, i reckon mine would be in its prime to do the change at the moment but i'm not sure i want to risk it or commit to a salt water tank. I have seen footage and photos of some very big mangrove jacks caught over east in lake Awoonga that have spent their entire lives in fresh water and still grow up to be monsters. Baby barra... they are pretty cool actually. They always come and see me when i walk in the room... No doubt hoping for more blood worms. These guys are utter pigs! source yourself a bull rout from over east mate, awesome aussie fish and super unusual! even an Australian lungfish would make an interesting addition to an aussie display. So cute, they have piggy look to them too. Oink! I didnt think lungfish were an option. Bullrout is a good idea. I am that guy that always gets spiked, stung or bitten though. There is a farm in queensland that produce Australian lungfish. They are seasonably available. Expensive though, I have been quoted $650-1800 depending on the time of the year and sizes. I have kept aussie lungfish in the past, great fish. They are like having a living fossil in your home, next level stuff. Actually now you mention it i think i remember reading a thread about lungfish availability here a while back. 1800 for farmed fish is crackers imo... Depends how bad you want it though i suppose and they are one of a kind fish. If you want your lungfish to be legal it must be a farmed and chipped fish though. Edited by Peckoltia, 20 November 2013 - 07:43 PM. Freshwater sole? Cant decide if i want one or not. Cool or creepy? Sole are great fish, all depends on what you like mate. I swear my cod has agoraphobia! I would have to poke the SOB with a pointy stick to get him out of that pvc pipe. He was recently put into isolation for an unprovoked assault on two slightly bigger silver perch. The charge has since been upgraded to two counts of murder. Edited by malawiman85, 23 March 2014 - 07:22 PM.